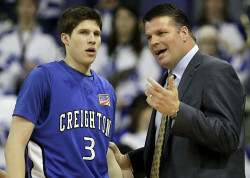 First-year Creighton University Coach Greg McDermott, a 1994 graduate of the United States Sports Academy, and his son, Greg, left, helped lead the Blue Jays to victory over Northern Iowa. Before he was named head men’s basketball coach at Creighton University, Coach Greg McDermott, a 1994 graduate of the United States Sports Academy, had come to expect more jeers than cheers from the raucous Blue Jays’ basketball fans in Omaha, Neb. But the same fans who rooted against McDermott when he played for and later coached the Northern Iowa University Panthers went bonkers for their new coach and his sharp-shooting son on 26 February, when the McDermotts led Creighton to a satisfying, 63-55, victory over their arch-rival in the Missouri Valley Conference. Doug McDermott, the Coach’s son, was the Blue Jays leading scorer in the victory, with 13 points, to help end the Blue Jays three-game skid to the Panthers. The victory was no doubt sweeter because Doug had intended to follow in his father’s footsteps and originally signed to play for Northern Iowa, but changed his commitment when his dad was hired by Creighton last spring. Coach McDermott made national headlines when he signed a lucrative $9 million contract to lead the Blue Jays, following four seasons at Iowa State University. Prior to his stint at Iowa State, McDermott had coached at Northern Iowa for five seasons, where he led the Panthers to a school-record 23 wins in 2006 and the team’s first-ever Associated Press Top 25 ranking. Unfortunately, success did not follow McDermott to Iowa State, where player suspensions and transfers left the program in a perpetual rebuilding mode in the grueling Big 12 Conference. McDermott overcame adversity by utilizing the professional coaching skills he acquired while pursuing his master’s degree in sports management from the Academy in 1994. McDermott earned his master’s degree while serving as an assistant coach at the University of North Dakota. Completing his master’s degree opened the door to his first head coaching job, at Wayne State University, where he coached from 1994-2000 and compiled a record of 116-53, including two appearances in the NCAA Division II tournament. He coached at North Dakota State for one year before beginning his five years at Northern Iowa.